Properties in Gore Bay average 4.9 out of 5 stars. 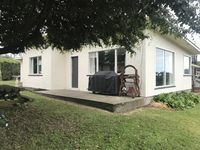 Well set up bach in a quiet and picturesque spot, with great view of river and short walk to the walkway north to Manual Bay and on to Point Gibson. 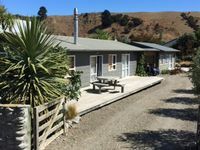 Ideal for quiet and relaxing break - kitchen had everything we needed, bed was comfortable, we enjoyed the cosy fire and lots of games is a plus for wet weather days. We would definitely stay again and recommend to others. Great place to stay, delightful village. Sadly no salmon for us but one day!